As the son of a major college basketball coach, I grew up in a competitive environment. I have great memories of being active in all sports: baseball, soccer, track, tennis, golf and basketball. Fortunately, I had two important things going for me, I loved sports (competition) and God had given me a lot of natural athletic ability. My father, who is an amazing man, never forced me into any sport but exposed me to everything so that I find my passion. With that being said, I remember being in Pee-Wee basketball (probably around the age of 7 or 8) playing in a game. During that game, I recall my father getting upset with me while I was playing… don’t quite recall what led me to tears on the bench… but I think it was not dribbling with my head up. This story is important for all parents to hear. That basketball game was 30+ years ago and it is locked in my brain forever. I recognize this isn’t a heartwarming story… but one that has taught me some important lessons as I now have my own children. 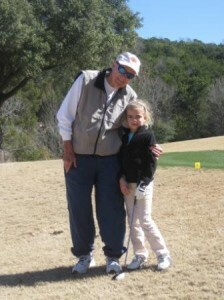 As it relates to golf, it has given me a unique perspective, especially when I want to see my little athlete be #1. Children are fragile. We as parents need to be extremely aware that getting angry over things like hitting a golf ball, missing a 2 foot putt or wanting our child to focus – this may not be as big of deal in the grand scheme of things. Sports = Game. Golf more than any sport has so many valuable assets that can assist a young person in business, life, and relationships. If we “burn them out” or make it not a game, then when they are old enough to make their own decisions, they won’t choose golf. I don’t claim to be a great parent, but I can speak a voice from a 7 year old boy on the basketball bench seeing my dad disappointed in me. Our children want to please us, I just encourage everyone to recall my experience next time you feel yourself “getting excited” over that missed putt! Here is to birdies for life!